Americans love baked, fried and boiled potatoes. Almost every recipe has garnished potatoes. 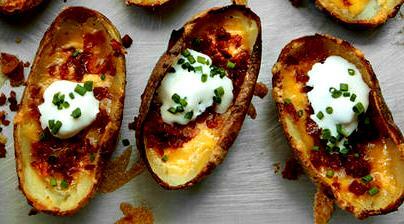 Baked potatoes are easy and quick to make. Brush both sides of the potato slices with butter; place them on an greased 1/2 sheet. Bake in the preheated 400 degrees F oven for 20 - 40 minutes or until lightly browned on both sides, turning once. When potatoes are ready, top with cheese, salt, pepper, bacon, and green onion; continue baking until the cheese has melted (around 3 minutes). When the cheese has melted, add sour cream and ketchup. Serve with Carne Asada and Fresh Salad.